Galbraith studied agriculture in his native Canada and agricultural economics at UC-Berkeley. He taught at the University of California, served briefly in FDR’s administration and went on to Harvard. In Cambridge, England, he discovered the new economics of John Maynard Keynes. During World War II in Washington, he held the key job of organizing and administering the system of wartime price controls. After the war, Galbraith directed the survey that interrogated former Nazi leaders to assess the effects of the air war on the German economy. He then worked for the State Department as administrator for economic affairs in the occupied countries and served as an editor of Fortune when the magazine employed some of the best writers around. Galbraith returned to Harvard in 1948 and wrote three of the most influential books on economics of his time, The Affluent Society, The New Industrial State and Economics and the Public Purpose. 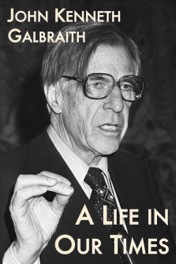 In these lively memoirs, the author relates all of this and more — his two major political campaigns, with Adlai E. Stevenson for whom he was adviser and speech-writer, and John F. Kennedy, for whom he campaigned across the country; his years as ambassador in India; and his long opposition to the Vietnam war. And he shares the lessons learned from these experiences.